The Duchess of Sussex has followed tradition by having her bridal bouquet placed on the tomb of the unknown warrior at Westminster Abbey. The royal tradition, started by the Queen Mother, usually takes place the day after the wedding. Meghan paid tribute to Prince Harry's mother, Princess Diana, at their wedding by including forget-me-nots, her favourite flowers, in the bouquet. It also contained flowers handpicked by the prince at Kensington Palace. It was designed by London-based florist Philippa Craddock, who also created the floral displays for St George's Chapel and St George's Hall using locally sourced foliage. Myrtle sprigs from stems planted by Queen Victoria at Osborne House, on the Isle of Wight, in 1845 were included, as well as sprigs taken from a plant grown from the myrtle used in the Queen's wedding bouquet in 1947. The plant became a family favourite after Queen Victoria was given myrtle by Prince Albert's grandmother during a visit to Gotha in Germany. Later that year, the couple bought Osborne House as a family retreat and they planted the sprig against the terrace walls, where it continues to bloom. It then became tradition for royal brides to carry the plant after Queen Victoria's eldest daughter, Princess Victoria, used it in her bouquet in 1858 - including the Duchess of Cambridge and Princess Diana. The petite bouquet carried by Meghan also contained scented sweet peas, lily of the valley, astilbe, jasmine and astrantia. Lily of the valley - the birth flower for May - is said to represent love and appreciation, the astilbe is said to symbolise patience and dedication, and astrantia means strength and courage. The flowers were then bound with a naturally dyed, raw silk ribbon. The Queen Mother began the tradition of leaving the flowers on the grave in Westminster Abbey in 1923 after her wedding to the Duke of York - who later became King George VI. She is said to have left the flowers there in tribute to her brother Fergus, who was killed in 1915 during World War One. 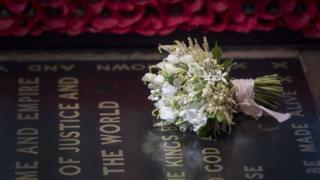 The Duchess of Cambridge also followed the tradition by having her bouquet left on the grave in 2011. The grave - which is at the west of the Nave of the Abbey - contains the body of a soldier brought back from France after World War One. He was buried on Remembrance Day, 11 November, in 1920, along with soil from the country. The idea is thought to have come from a chaplain, the Reverend David Railton, who served at the front during the war, after he saw a grave in a back garden in France with the words "an unknown British soldier" pencilled on. A large public ceremony took place for the burial, which included King George V laying a wreath of red roses and bay leaves on the coffin. The grave is covered by a slab of black Belgian marble and contains a long inscription, including the words: "They buried him among the kings because he had done good toward God and toward his house."